Have you heard of the “Long” form and the “Short” form of the serotonin transporter promoter region or of 5-HTTLPR? What do these terms mean? Whether we like it or not, mental health professionals are now frequently exposed to the terms/abbreviations like 5-HT, serotonin transporter, SERT, 5-HTT, SLC6A4, serotonin transporter promoter, 5-HTT, 5-HTT-linked polymorphic region, 5-HTTLPR. Let’s find out, step-by-step, what each of these terms means. And what all this has to do with our work. Chemically, serotonin is 5-hydroxytryptamine, so it is abbreviated 5-HT. The reuptake of serotonin into the presynaptic neurons occurs through the serotonin transporter, which is called 5-HTT or SERT (both meaning the same thing—serotonin transporter). One part of this gene is called the “promoter region” because it affects how much the gene is expressed into protein. That is, it “promotes” the expression of the gene. The promoter region (see no. 4) of the serotonin transporter gene has a segment that is polymorphic, i.e., can take more than one form. This region of the serotonin transporter promoter is, therefore, called the 5-HTT-linked polymorphic region or 5-HTTLPR. So, in the term 5-HTTLPR, the 5-HTT stands for serotonin transporter and the LPR stands for the polymorphic region that is linked to the serotonin transporter gene. Based on the number of repeated nucleotides, the 5-HTTLPR can be said to either be “short” or “long.” The classification number for this polymorphism is rs4795541. Each person has two alleles for the serotonin transporter gene. Based on the variation in the 5-HTTLPR, a person can have two copies of the short allele (i.e., S/S), two copies of the long allele (i.e., L/L), or one copy of the short allele and one copy of the long allele (i.e., S/L). Sometimes, in the long allele of the 5-HTTLPR, at one location instead of adenine, there is guanine. The notation for this is A>G or rs25531A/G. These two forms of the Long allele are called LA and LG, respectively. When a person has the LG allele, this reduces expression of the SERT gene to nearly the same level as the short allele does (Hu et al., 2006). In other words, having the LG allele has the same effect as having an S allele. Note: The Genecept assay distinguishes between the LA and LGsubtypes of L, but the Genesight test does not. What is the significance of the low-expression and high-expression forms of 5-HTTLPR? S or LG alleles can be considered “low-expression” alleles in 5-HTTLPR because in a person who has two low-expression alleles, the production of the serotonin transporter is reduced to about half of that with the gene with both high-expression alleles (LA/LA). That is, there is low expression of the gene. The low-expression and high-expression alleles act co-dominantly. That is, with one low-expression and one high-expression allele (LA/S or LA/LG), the production of serotonin transporter will be intermediate. 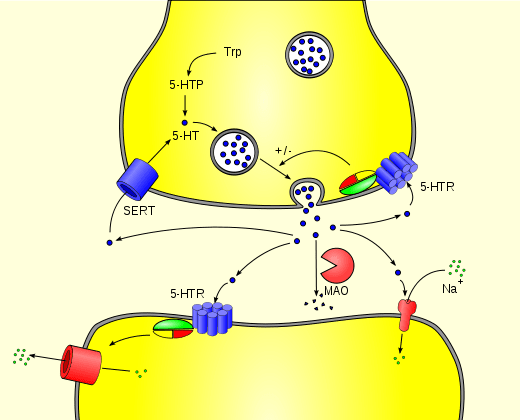 It is not entirely clear how the number of serotonin transporters affects serotonergic neurotransmission. One possibility is that availability of fewer serotonin transporters means fewer sites from SSRIs to act on (Leckband et al., 2007). Another possibility is that availability of fewer serotonin transporters means more serotonin in the synapse, which would result in downregulation of pre- and post-synaptic receptors. If these persons are “maximally down-regulated,” effects of SSRIs may be limited (Leckband et al., 2007). 5-hydroxyindoleacetic acid or 5-HIAA is the main metabolite of serotonin. The 5-HIAA levels in the CSF have been found to be higher in patients with “treatment-resistant” major depressive disorder and one or both S alleles (Kishida et al., 2007). Perhaps because neurotransmitter systems in the brain interact with each other, the CSF concentrations of homovanillic acid or HVA were also higher in persons who had”treatment-resistant” mood disorders and the S/S genotype (Kishida et al., 2007). 1. The L allele is less frequent in persons of Asian origin compared to Caucasians. L/L genotype: 29 to 43% of Caucasians, 1 to 13% of East Asians (Goldman et al., 2010). S allele: 42% of Caucasians, 79% of Asians (Kunugi et al., 1997). S/S genotype: 21.6 to 28.3% in studies with mainly Caucasian subjects, 55.6 and 60.0% in studies with Asian subjects (Smits et al., 2004). 2. There are also differences in the prevalence of these alleles between Caucasians and African Americans. The S/S genotype is present in about 4% of African Americans. In both races, the frequency of the LA allele is about 50%. But for the other 50%, in Caucasians it is 40% S and 10% LG, while in blacks it is about equal, i.e., 25% each. If the same thing is stated in a more complicated way, in Caucasians, the S:LA:LG ratio is 4:5:1, whereas in black patients it is 2.5:5:2.5 (Hu et al., 2006). CNSDose® (Baycrest Biotechnology Pty Ltd, Melbourne, Victoria, Australia). Kishida I, Aklillu E, Kawanishi C, Bertilsson L, Agren H. Monoamine metabolites level in CSF is related to the 5-HTT gene polymorphism in treatment-resistant depression. Neuropsychopharmacology. 2007 Oct;32(10):2143-51. Epub 2007 Feb 14. PubMed PMID: 17299512. So if the L and S Gene or La LG genes are codominant does that mean that each cell expresses both genes or that they are Expressed​ on fifty-fifty basis approximately in the brain’s serotonergic neurons? And would that make any difference? thanks for your consideration.